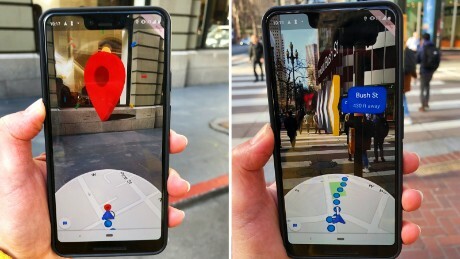 On Monday, Google Maps began letting some users test a new augmented-reality feature in its mobile app that shows graphics — such as highlighted arrows and street names floating in midair — over a live view from their camera on their smartphone screens. It is meant to help them navigate city streets. 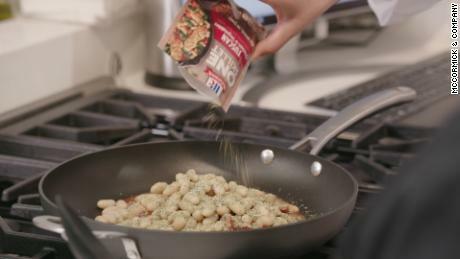 Google’s Rachel Inman, who works on user-experience for the new feature, said the company hopes to make it simpler to go between the two-dimensional map on your phone and the three-dimensional world around you. “We’ve all had the experience of coming up from the subway and walking a half block or a full block in the wrong direction and being really annoyed when we have to turn around and walk the way we were supposed to go in the first place,” she told CNN Business at a real-life demonstration of the feature in San Francisco on Monday. Yet while many companies, including Google, have been working on augmented reality products for years, few had luck with consumers. (Pokémon Go, created by Niantic, which spun out of Google, is a notable exception.) There are two main reasons for this: it’s hard to figure out what to do with the technology, and difficult to make virtual images actually mesh with the real objects around you. Google Maps thinks it has cracked this nut, and it gave CNN Business a peek at it during a walk from a park on San Francisco’s waterfront to a coffee shop about half a mile away. Using the feature within Google Maps on a demo smartphone, I saw the names of upcoming streets hover in the air ahead of me on the screen. When I was supposed to turn, large arrows appeared to help guide my way. Upon reaching my destination, a big red Google Maps pin popped up in my field of view. As the feature is in the early stages of user testing, Google still has some kinks to work out. For instance, I noticed that the AR images in the app stopped working several times while I was walking to the coffee shop. But if I was in a new city, it could save me time debating which direction to go — especially if I had just hopped off a bus or train. Google said that for now, the feature is only being offered to a small group of people who frequently use and contribute to Google Maps. The company isn’t saying when it will be generally available. “We are still learning a lot; this is still very early,” cautioned Marek Gorecki, an engineering manager for Google Maps. One reason the technology takes time to perfect is that it is difficult, even now, to reliably find where you are and what direction you’re facing on a smartphone map. Typically, a smartphone uses its built-in GPS and compass to determine your location and what direction you are facing in a mapping app. In crowded cities, however, this can get tricky. GPS relies on having a line of sight to pass along radio signals from far-off satellites to your phone, so tall buildings can make it hard to figure out exactly where you are. The compass, too, can be thrown off in urban places because of the abundance of magnetic objects such as metal in buildings, cars, buses and city infrastructure — such as light poles. Google is using artificial intelligence to help figure out where things are. The company has a decade’s worth of images of streets and landmarks around the world from its Street View program. The new AR feature has users hold up their phone so it can match up details about landmarks (including buildings) with those visuals that the app has already captured. Google Maps uses machine learning to determine which details are likely to be the same and which are best to ignore (such as trees, since they may change depending on the time of year). Once Google Maps has a more precise idea of where you are, it can overlay virtual images on what it sees through the smartphone’s camera. They may look more like they are integrated with reality — something that has long been a challenge for companies building AR into smartphone apps. For now, Google is trying to keep these images simple. An earlier prototype of the AR feature displayed fireworks when a user approached their destination in Google Maps, said Gorecki. The team decided that wasn’t a good idea.